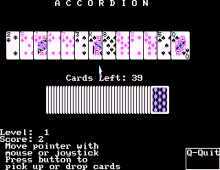 "In each level, varying numbers of cards are dealt on the screen in rows from left to right. A card (and the stack of cards beneath it) may be moved onto the first or second card-stacks to its left whenever it matches either of these cards in suit or rank. The aim of the game is to reduce all the rows of cards into one pile by repeatedly moving stacks of cards onto neighboring stacks. Each time a move is made, another card from the deck is turned up until it is empty. After making each move, be sure to check for additional possible moves. Remembering not to lock yourself out of a suit seems to be the best strategy to use in playing Accordion. You won't tend to paint yourself into a corner if you will not watch the cards to the right as you move cards to the left. Getting down to less than ten cards is fairly easy. However, at that point a single card can keep you from winning because it is the only card of that suit remaining, and no card of the same rank exists to play it on."